Here is an after picture, which looks exactly like the before picture as the only restoration work was done on the inside. 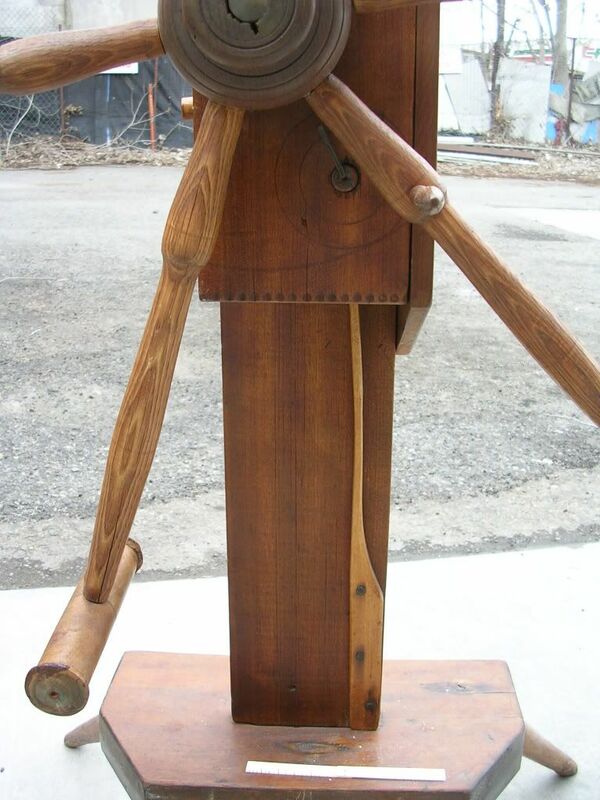 The original is made of poplar, the legs and hub are of walnut, the spokes are chestnut and the ends are maple. There is maple and white oak on the clock works. As with most clock reels something happened to cause binding and invariably a couple of side grain teeth are broken off one or more of the gears. Sometimes the worm gears get damaged but by and large the big problem is with the gear teeth. The ‘weasel’ on this particular reel is made of maple and makes quite a ‘pop’. Yes that is where it comes from. Here is the gear prior to restoration, showing two teeth that are missing and two teeth that are damaged. I determined that I should also replace the damaged teeth as well. I followed the lead of the famous English Cabinetmaker/Clockmaker John Harrison and put the grain of the teeth in their best advantage. 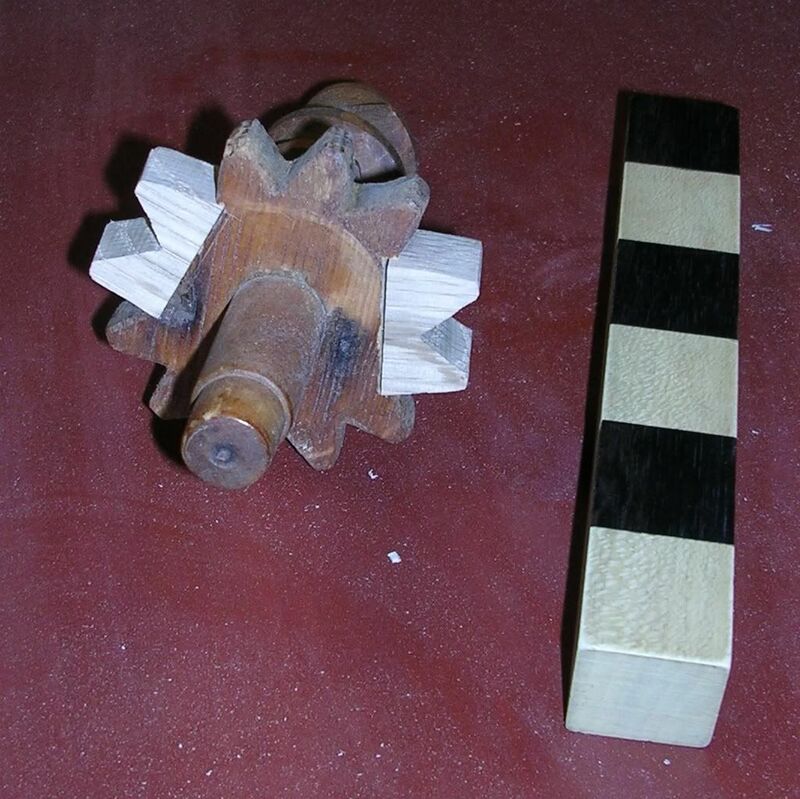 The gears failed because of the weak side grain of wood. Here are the interior workings of the clock reel. This is the repaired gear in place in the mechanism. I noticed that during the restoration that the top and the board on the right side are replacements, probably made of cypress, but I am not sure. This caused the problem as the hole for the mandrel was too small, bound up and caused the damage to the teeth. When the teeth are missing the clock mechanism will not work and the weasel will not pop. I slightly enlarged the hole for the mandrel put it in place and it worked just fine. The reel functioned perfectly and made its pop at the proper time. Keep up the posts on restoring old stuff. People always seem to focus on making brand spankin’ new woodworking projects. I happen to lean towards the revival of old wooden stuff. There is something elemental in bringing an old piece of furniture, or tool, or whatever, back to a fully functional life. I will keep posting because the old stuff keeps wearing out or breaking and people just look me up. I got my start in traditional woodworking doing antique restoration, had to have hand tools and it went down hill from there. I do enjoy restoration work, something always new. Stephen, My husband came home from an auction last weekend with a weasel yarn winder for me. It’s old and has had much use from the looks of it. We think it is missing a piece or maybe more. In pictures I’ve seen of other weasels, there is a “stick” (mandrel?) that pokes out of a hole in the top of the box. There is a hole (but no stick) in the one he purchased, so we thought that might be the case. Thank you for posting the pictures of the restoration of your piece. I think we will find that helpful as my husband tackles making ours useable. Any other advice or sources of information you might have would be appreciated. Welcome, and the hole in the top of the box is for a turned finial that decorated the clock reel and was also a handle for moving it around. My clock reel, which is in need of restoration has a hole in the top board and a turned decorative finial / handle on top. Thank you for your quick response! You may be hearing from my husband, Lowell, with further questions. We’re trying to figure out the mechanics of how it should work! My clock reel/weasel has broken edges on the worm gear. Have you source of how to fix same. I’ve the needed tools (lathe,drills,router, etc and after 45 years of wood working have all fingers intact. Reel has all parts in other wise good order. It is three legged with 6 arms. All wood, no metal parts. Mostly maple, three legged base, removable pegs to separate base from pedestal, hub, axles, gears all enclosed in box, hickory pop lever all in good shape. Bought locally for $35 last month. 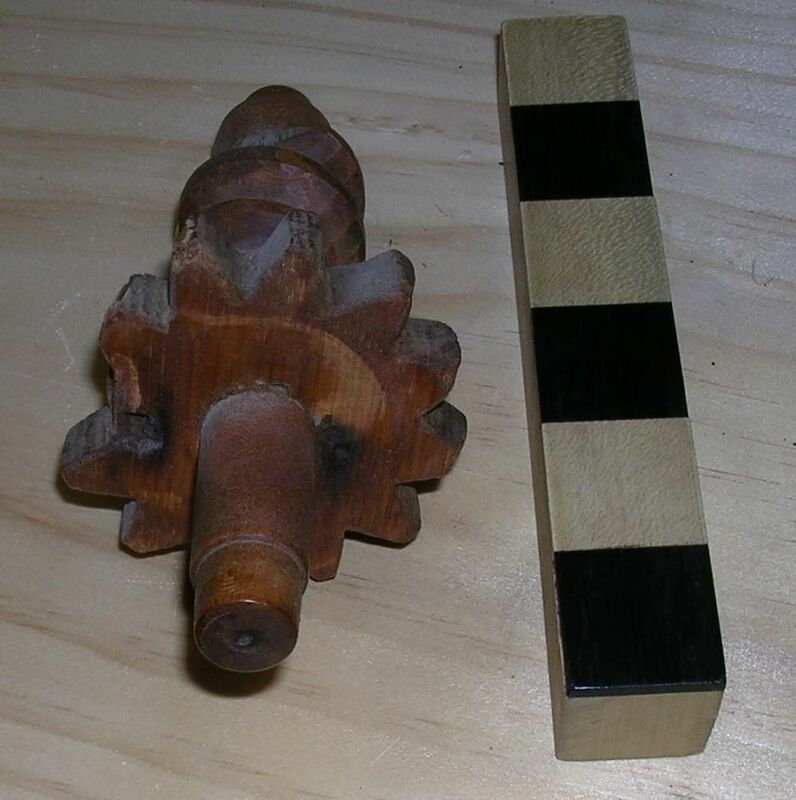 I would do the same type of repair for the worm gear as with the tooth gears and use the dovetail method if possible. Use hide glue for the repairs. Kasey and her husband purchased a clock reel yesterday at an antique store. 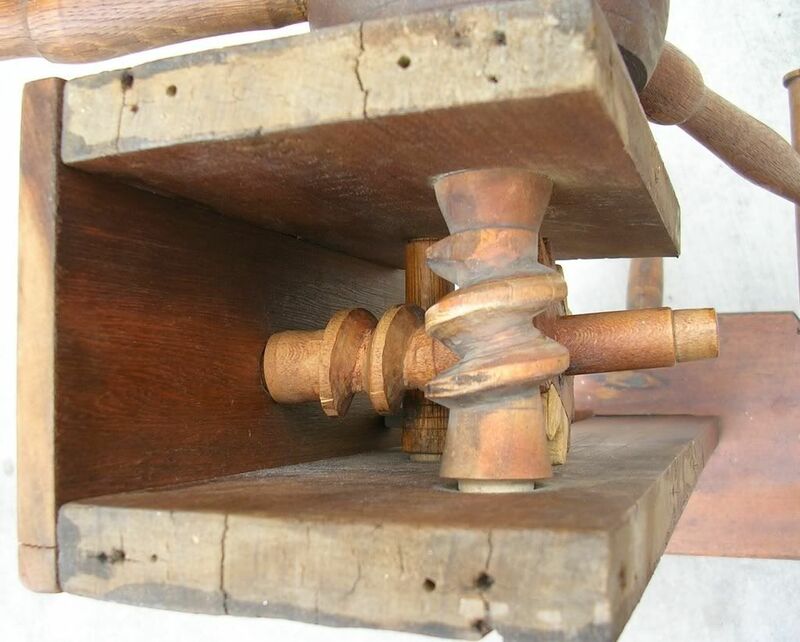 It works to wind yarn but the interior parts do not move so the counting mechanism does not work. Wouldn’t it be nice if you were nearby and we could get help from you personally. We’re in the San Fernando Valley (part of Los Angeles, CA). What advice do you have for a bunch of amateurs who have limited knowledge and some woodworking experience but not a lot of tools or money? 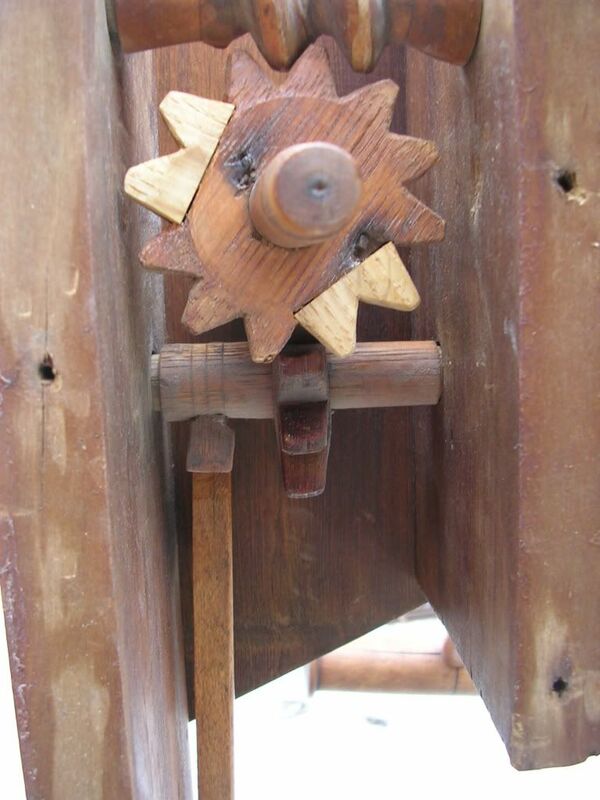 There could be something as simple as a sheared peg on the gear wheel that causes the mechanism not to count. Or it could be damage to a gear tooth or two which would also cause it not to work. 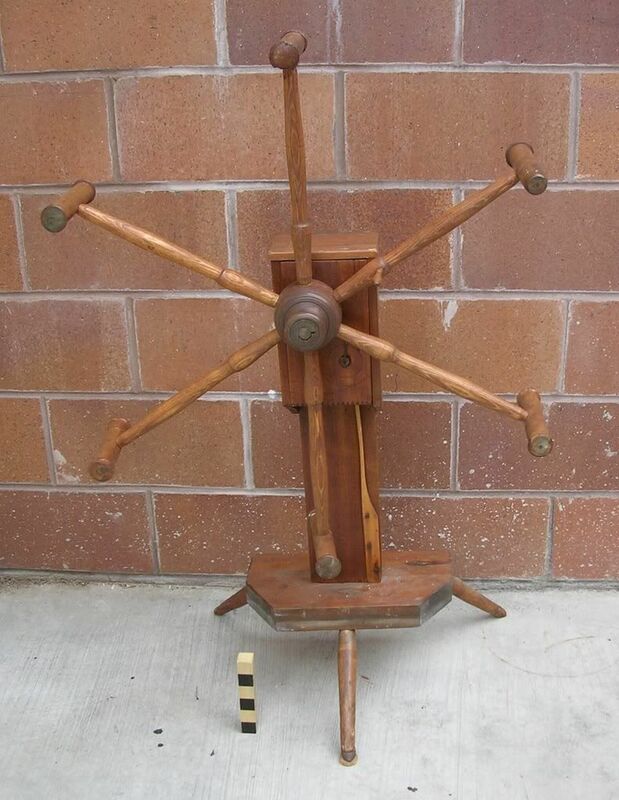 I live in Salt Lake City, you could ship the mechanism without the wheel or legs if they are removable. You might also find someone that restores antiques in your area that could handle the repair. Good luck.